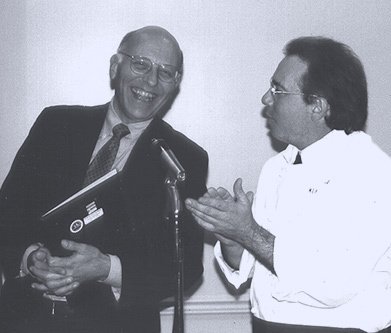 Matthew Harre and Rodger Ellsworth at the AMSF 10-year anniversary celebration held October 4, 1998. Matt holds a plaque of appreciation presented to him by AMSF members, and shows obvious enjoyment of the "roasting" he has just received from Rodger, in chef's garb, and other very willing participants. It is customary for the current AMSF president to write an article for Keynotes upon the departure of a member of the Board of Directors that describes the board member's contributions to AMSF and expresses thanks on behalf of the organization. But what a responsibility that becomes if the person departing happens to be the founder! How do you adequately thank the person who started the organization who has given so much in nurturing it for 13 years? This was the perfect occasion for a bit of collaboration among current and former presidents, people who have been in a position to recognize and appreciate the gifts Matthew Harre has bestowed upon us all as founder and mentor of the Adult Music Student Forum. So, here they are, speaking for themselves--but on behalf of us all--beginning with the first President, Joanne Rousseau Muench, and ending with our current president, Raye Haug. But first, lend an ear to Rodger Ellsworth, Matt's good friend, and the presenter of AMSF's first Special Event. A few years ago Matthew approached me and asked if I would lecture to a group of adult music students. This was an honor I still feel with pride. He said that this would be the first event of the new group he was founding called, "The Adult Music Student Forum." The idea in and of itself is still considered radical. The conventional wisdom held by many music teachers is that adults are incapable of learning a musical instrument. If the person did not start an instrument as a child, said the teachers, then they would never learn to play. The adult was given a sentence of "Life without Music." The only instrument available to them was the phonograph. It was Matthew Harre who conceived of a safe haven where adult music students could thrive in an atmosphere of intelligence and mutual respect. These qualities of intelligence and respect are my friend Matthew's way of life. A place to practice a civilized art form in an intelligent way and respectful fashion is his gift to our society. I salute his contribution to the musical world. Greetings from Northern California where, at this moment, the power is on. Shortly after meeting Matt and starting lessons, two major events occurred: The Ellsworth Studio began its demise and Ronald Reagan was elected. Everything changed. Seeing an opportunity to press a lawyer-colleague into service for the good of musicians everywhere, we lunched in a practice room while Steve relayed information to Matt about setting up as an independent teacher. The rest, as they say, is history. Over time, we managed quite nicely, I must say modestly, to create the Forum by combining Matt's fine ideas with a practical plan, lots of collaboration from fellow students and other teachers, gracious hospitality from hosts, and use of community resources (an evening at the Hungarian embassy was an early triumph for the Forum). Pressing people and resources into service for good of the Forum characterizes my tenure as President. We set high standards, we experimented, we had some disasters, we made music, and we had fun. That the Forum is now thirteen years old is a tribute to all of us and especially to Matt. Matt's legacy as the AMSF founder is an estimable one: he created a civilized and welcoming forum for adults to continue to develop their talents and interests. We are all grateful. Dear Matt, we certainly have had some wonderful, wild and woolly times on the AMSF board all these years. And conflicts and difficulties notwithstanding, we got a lot of work done and grew by leaps and bounds. Your idea and concept of this Forum has been more than realized and has grown beyond all of the original members' wildest dreams. Did we all think it would have come this far and this strong? Growing out of your "soirees" in your adult students' homes, we ventured forth with the professional management guidance of Joanne Rousseau Muench as president. Yes, the Mission Statement was born, and we began. Karen Devitt, as Vice President, provided marketing services; Eva Nagorka Ellsworth, the necessary Secretary/Treasurer services; Walter Kirkland, the newsletter; Fred Scheer, the Informal Recitals; Allan Reiter, the Formal Recitals; Gertrude Brown as teacher consultant and advisor for the Lecture Series (now Special Events); and I kept the membership records. For five years, Joanne bravely held the helm steady and then I took over for her while Susan Green organized our incorporation. Susan Green, Joyce Morton and Raye Haug have been running the show since then. And throughout all of our tenures, you have guided, strengthened, lightened and enlightened each of us and our fellow board members with your generosity, perseverence, wit and wisdom. So it is now as you step down off the board, the five presidents, for themselves, for all the board members and members past and present, salute you. Thank you for wanting this Forum to exist and thrive. Thank you for all your daily hard work in making it happen. Thank you for your tenacity in seeing it through thick and thin. Thank you for your ever present grounding in the fundamental ideals of the Forum. And thank you for the joy, laughter and love. When I learned that all the past presidents of AMSF were being asked to reflect on their experiences working on the Board with Matt Harre, my first thought was that I was president so long ago that it would be hard to remember what my impressions were at the time. My second and third thoughts confirmed this dilemma. Nonetheless, I will attempt to distill the essence of my memories from those years. I initially joined the AMSF board, at Matt's request, as the informal recital coordinator. I had attended a couple of informal recitals at my teacher's suggestion, and had volunteered to host one. I had never been asked to serve on any kind of organization board before and, although I was excited at the prospect, I felt a bit intimidated. I quickly realized that everyone else on the Board was either a close friend or student of Matt's. I felt a bit of an outsider since I didn't know any of them and I studied with a teacher at the Levine School of Music. Also, as very much a beginning piano student, I felt a little unsure of my right to participate on the Board. I didn't have the musical knowledge it seemed everyone else had. Little by little, I came to feel more comfortable as part of the group. It was, after all, just a group of friendly individuals who loved music and wanted to be able to share that love with others. In addition, as time went on, my role on the Board changed. I served as Vice President and then as President. During that time, we made and implemented the decision to incorporate and seek our tax-exempt status with both the I.R.S. and the District of Columbia. As I was taking responsibility for these tasks, I had to work more closely with Matt to make sure the corporation and its objectives were appropriately described in the necessary documents. I suppose what strikes me the most about those years on the AMSF board, both as president and in other positions, was Matt's continuous presence. He showed up reliably and has continued to do so for many, many years. The meetings were always at Matt's house, even when he still had children living at home. This, as anyone who has hosted functions knows, is a considerable gift. He attended all the initial recitals, including informal recitals. He was always available to the board for consultation on AMSF issues. He was the driving force for incorporation as a tax-exempt organization, and he was a reliable partner in working on the organizing documents and the application for tax-exempt status. The AMSF telephone still rings in his home. On the Board, he exerted a steady influence--offering the wisdom acquired from his service with other organizations--but wasn't domineering. He listened to views other than his own, and he retained a sense of perspective about what we were doing and a good sense of humor. When I returned to playing the piano after a break, I asked Matt if he would be my teacher. He was kind enough to find some time for me and so for the last two years I have come to know him in a different way. Here is how I sum up my thoughts about Matt: dedicated to teaching, humble, grateful, playful, compassionate, open and awakening. I salute you, Matt. And I'll try to practice more in the future! I joined AMSF about a year and a half after Rodger Ellsworth "launched" its first Special Event with a lecture on "Performing for Pleasure" on May 17, 1988. My friend and former business partner, Tom Potter, told me about the group and of a lecture that its founder, Matthew Harre, was to give toward the end of 1989 at Strathmore Hall in Rockville entitled "The Needs and Goals of Adult Music Students." The time was right. I was getting back to piano after years of abandonment, so I decided to attend. I joined that same evening. There was a $10 charge for attendance for non-AMSF members, and membership was only $25, so being the practical person that I am, it seemed to make good economic sense to join. At that time, AMSF had a membership of just 43, and it sponsored the activities it did at its founding--Special Events, the quarterly newsletter, Keynotes, and two recital series, descriptively named "Formal" and "Informal." By the first part of 1993, it had become apparent there was a need for another recital series, informal in nature and one that could accommodate a broader repertoire than the existing Informals. That was when I was asked to join the AMSF Board of Directors to begin such a series, one that we named "Cadenza." Sue Suffae hosted the first Cadenza recital on May 25, 1993. Besides satisfying the administrative and programming needs of a fledgling arts organization, there were perhaps two primary concerns of the Board that I joined--(1) how to enlist more members and (2) how to keep costs from exceeding income. Two activities undertaken by the Board not long after I joined were designed to address the latter concern and did so effectively. Another Board member, Susan Green, led a successful effort to incorporate and to obtain 501©(3) status that makes monetary donations to the organization tax deductible to the donor. Further, AMSF undertook a fund-raising campaign that, due to the responsiveness of its members, wiped away the debt that had been incurred during its earliest years. It turns out that growth in membership has taken care of itself. Most people hear of AMSF by word of mouth, either from existing members or teachers who know of it. We now have a membership of 129, and a concern of the current Board may be how to satisfy the needs and interests of all these people. This is but a bit of the growth I have witnessed in AMSF over the years. The organization is much more vigorous and mature than in 1989 when I joined. Community Outreach was added in 1995, originally coordinated by Sue Suffae, now by Anne Williams. Another informal recital series was added in October, 1995, and so we now have both Informal-A and Informal-B recitals. I developed and published the AMSF web site in mid-1998. The Board of Directors has just recently implemented a budgeting process to keep costs under control. And it has in place an organized bookkeeping and record retention system and is even about ready to approve a policy manual that will inform and guide new and existing Board members in the performance of their various responsibilities. Absent Matthew Harre's initiative in founding AMSF, there would have been no history to recount. Nor would we have the multitude of performance and music education opportunities that make such a difference in our progress as adult student musicians. To found an organization where none exists takes such a combination of vision, faith, initiative, risk, energy, and strength of commitment that most people are unable or unwilling to undertake such an endeavor. That Matt did so primarily for the benefit of adult students is true to the nature of the person I have come to so appreciate. Matt is above all else a teacher. He enjoys it, he is good at it, and he is totally committed to the profession and to his students. The Forum has been an extension of that commitment. By establishing and nourishing AMSF, Matt has benefited his own students, and he has extended his influence far beyond his own studio. Through the Forum, Matt has made meaningful contributions to the music education of all its members. And now the very existence of this robust grass-roots arts organization sets a precedent and provides a prototype for people elsewhere to emulate. Matt has decided it is now time to entrust the everyday administration of the organization to others. He will continue to be actively involved in a consulting capacity and in the planning of some Special Events. However, at this juncture, as Matt departs the Board, it is an appropriate time to recall the journey and to say "Thank you, Matt. Thank you for your vision, your initiative, your insights, your inspiration, and for 13 years of commitment to our education. Thank you for the many opportunities to grow with the organization. Thank you for caring. Thank you for believing in us. . . .And thank you for not kicking us all out at the stroke of 10." As current president of the Adult Music Student Forum, I salute Matt Harre, founder and mentor of this organization, as he steps down from his position on the Board of Directors. This organization has filled a special niche for so many adult Music students, myself among them. The supportive venues for performances provide a needed focus for adult musical study, plus the opportunity to interact with other Adults involved in musical pursuits. Though no longer a member of the AMSF Board of Directors, Matt Harre will continue to provide guidance and direction. His presence at board meetings, as well as his coffee, will be sorely missed. I hope, during my term of office, to perpetuate the spirit of this special organization of which Matt is, and always will be--THE FOUNDER.